A Tale of three Chuck's --- Woodchucks that is. 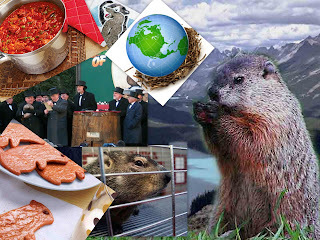 The woodchuck is a type of marmot that is also know as a Whistle-Pig, Ground-Beaver, and Groundhog, is never more talked about than on Candlemas Day. On the Second day of February there have historically been Candlemas celebrations that mark this mid point between the beginning and the end of winter on the astrological calendar. But in the United States it has come to be know as the somewhat whimsical "Groundhog Day". Each year celebrants gather to see if the Groundhog emerges from it's den and sees it's shadow. According to the tradition, adapted by citizens of Pennsylvanian from Germanic beliefs, if the shadow is observed winter will last an additional 6 weeks. Apparently Groundhog Day has it's Origins in Punxsutawney, PA where Phil is now the official prognosticator. However outside of Pennsylvanian several others compete for recognition. Here in Ohio Buckeye Chuck is the official winter weather predictor. So what happened yesterday. We are told that Phil saw his shadow whereas Chuck did not. So it is a tossup, I will go with the more local forecast by Buckeye Chuck. Also here in Berea to help us out we have Berea Bart. Bart is a letterbox which is placed out to determine the local forecast. Bart has the advantage of a cozy nest provided by another letterbox Marjorie. Apparently Bart was warm and snug yesterday and slept right through the morning so we have not been able to get a prediction from him. I did not bake my Groundhog cookies to celebrate the day, but I still may do so in order to have a sweet treat to accompany the other foods we will have for Superbowl watching next Sunday. I smoked a beef brisket late last year and found a large chunk of it which I had frozen. I am now thawing it out and plan on using it to make a pot of chili for the big day. We will see how it goes. I will publish my Chili Recipe later today or tonight.